Giving new life to our living space can be well within our reach. Are you feeling demotivated about the state of your apartment? Does it feel like you've had exactly the same decor for centuries or that your living space is beyond saving? These are common lines of thought for anyone who has been living in the same home for quite some time and feel like their little space requires a bit of a makeover. Similar to most as well, however, you may feel like your space is too small to do something with or that your budget is unforgiving. Fear not, because we are bringing you a project here on homify that is sure to get your inspiration levels up to a 100. The small apartment we will see here today, looked very drab and outdated after years of wear. However, a simple renovation made a world of difference. Let's take a look! First up we have the kitchen of this small apartment which we are about to explore during the process of its metamorphosis. 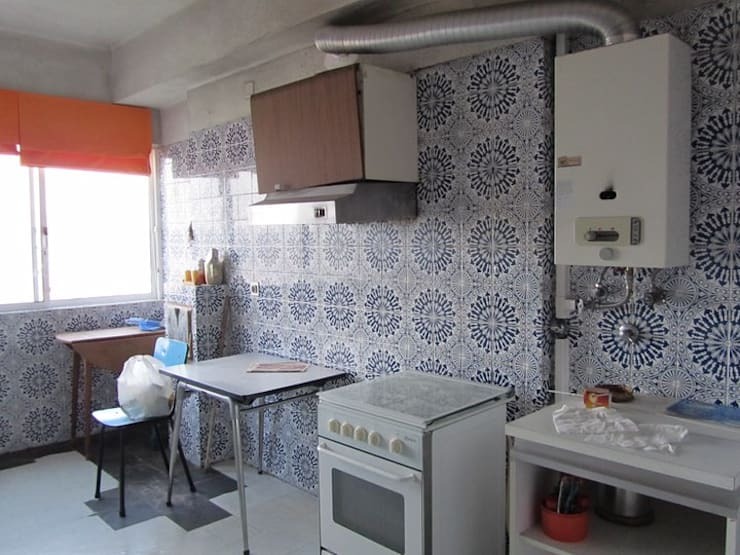 As we are sure you will agree, this kitchen looks anachronistic and out of place. The hydraulically pressed tiles offer an awkward pattern that seems too ambitious for the area, and the colours aren't really followed through in the space. We can see that the wooden cabinet doors, which are also just hanging by the hinges, aren't really suited to the tiles on the walls, making the ensemble look even more out of sync. In addition to all of this, the crowded and disorganised worktop space leaves little inspiration for cooking. A metamorphosis seems like an apt analogy indeed, as this kitchen has now turned into an elegant butterfly, far removed from the awkward caterpillar it had been before, as seen in the previous image. This new kitchen has been streamlined to basics, but done in such a way that it portrays elegance and can continue to do so regardless of its contents. 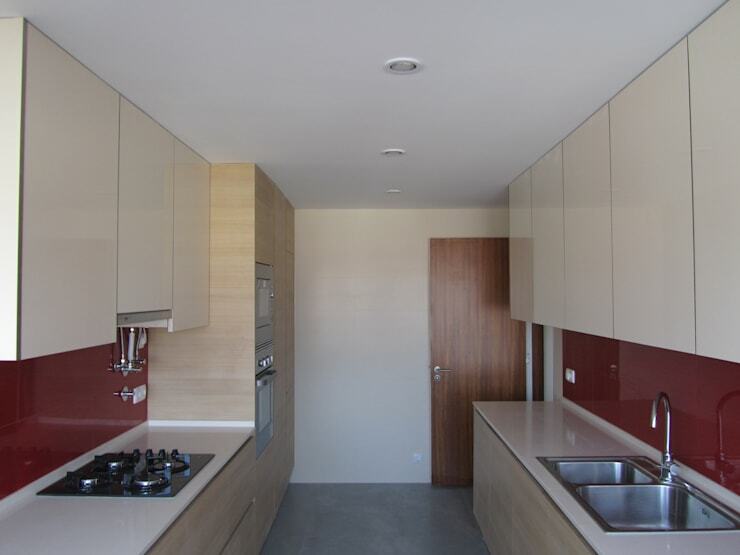 The cabinets were all replaced by neutral plywood to create a subtle background in conjunction with the off-white walls. Metallic appliances dot the plywood surface and laminate countertops, whilst a red backsplash area adds a colorful element. Next, we move over to the bathroom, as this is often the space in any home where you can see the greatest change of a renovation. 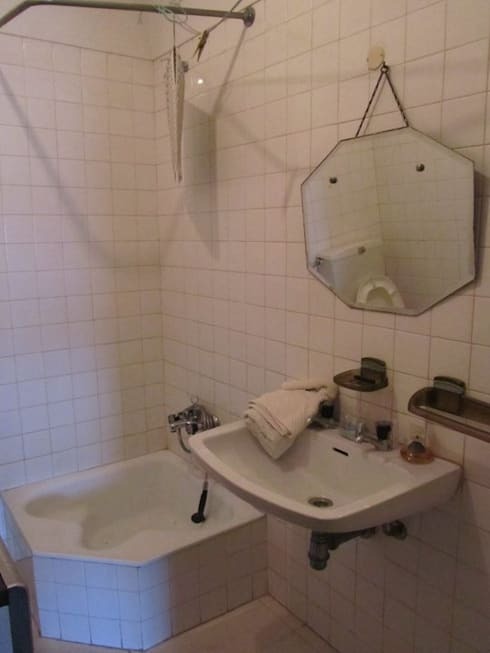 This despondent space certainly does not go very far in creating a pleasant bathroom environment, and the coldness of the atmosphere must make the inhabitants of the apartment dread using that room every day. This is definitely not the type of place you want in a warm and comfortable home. The tiny shower space looks so unappealing that the pleasant activity of taking a shower must even become more of a chore! Zoning in on the shower, we can see that the renovation has done much to make the bathroom to a more approachable and comfortable space. 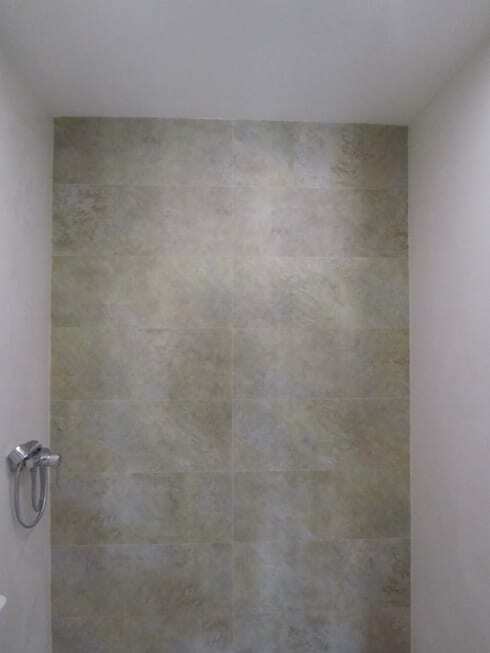 For starters, the shower space has been enlarged, ensuring a better experience. We can also see that the space has been re-tiled in stone material to give it a warmer and more elegant look. Now this is a shower we can look forward to! Now for the toilet. At first sight, this room makes us cringe for the disjointed nature of the style in which the space is furnished and decorated. Much like the kitchen we saw previously, patterned tiles cover this bathroom's walls, but it is very uninspiring and faded. In addition, none of the other fixtures in the space, such as the towel railings or toilet seat, suit these dull tiles whatsoever. 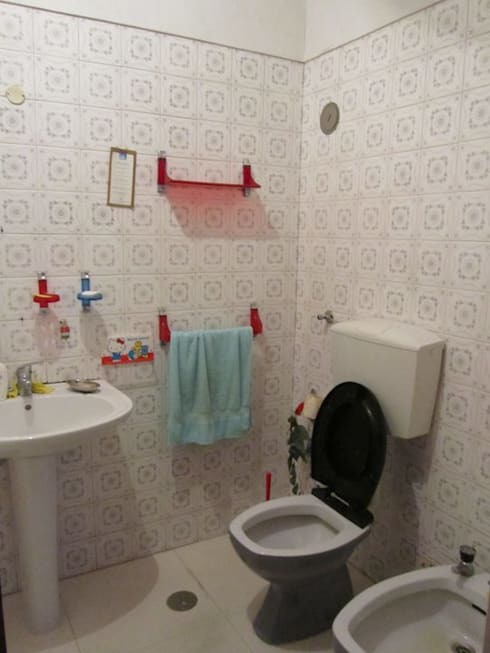 This is definitely a bathroom that could use a little pick-me-up. What a difference! We can see that the designers had to transform the space entirely, stripping tiles and furnishings. This is a strategy that panned out very well. The color scheme of this new area is neutral, providing a steady and clean background, but also allowing for a warm atmosphere. 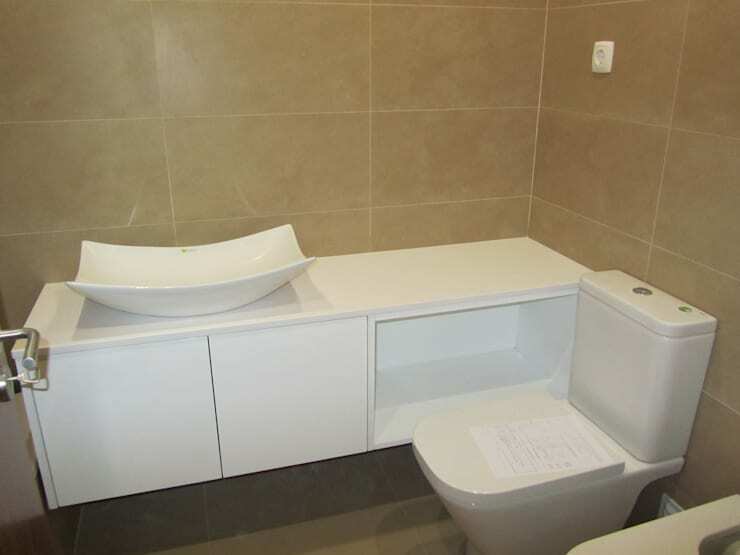 The white of the toilet, sink and cabinets contrast just enough with the brown tiles to give the room depth. A simple design that makes a big difference! If you're looking at renovating your own bathroom, why not go for a hotel style? We can clearly see that this little apartment had undergone only a few simple changes, but this has entirely renewed the look and feel of the place. This fills us with hope for our own home transformations! Let us know what you thought of this renovation in the comments!